There is an abundance of artifacts that represent the history and culture of the LGBT communities. Items like the walking stick that once belonged to gay civil rights pioneer Bayard Rustin, or foundational documents that established the first gay rights organization, the Mattachine Society, are scattered throughout the country. Many of these artifacts have already been discarded, lost or destroyed. 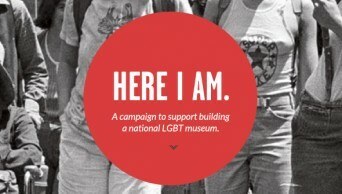 But the National LGBT Museum, which is making strides toward acquiring a building to house the first national historical institution for the community, was created to redress this problem — and also to celebrate, showcase and share our history through these artifacts. The museum has reached a milestone by completing the preliminary work of establishing a business model, creating a fundraising/development plan, collecting market research, and assembling a team of experts who comprise the board and leadership councils. So far, the museum has collected nearly 5,000 artifacts from figures such as Greg Louganis, Bayard Rustin, Tyler Clementi, and Frank Kameny. These objects (many of which were destined for the landfill) will have the platform afforded by a cultural institution in our nation’s capital, because they document episodic moments in LGBT history. For example, when Greg Louganis’ head collided with the diving platform during the 1988 Seoul Olympics, misinformation about HIV led to concern over whether other divers risked infection by the virus. This story, told through artifacts donated by the diver, is an integral part of LGBT history, and Louganis’ two gold medal-winning dives were a momentous Olympic victory for the United States. Posted October 3rd, 2013 & filed under News.